(Vatican Radio) Pope Francis on Monday encouraged bishops from the Republic of Congo to continue in their efforts of cooperation with other faiths because “unity in diversity is a feature of the Church’s requirements”. The Pope was addressing the Bishops from Congo who are in the Vatican for their Ad Limina visit. In his discourse the Pope expressed his joy before the “young and dynamic Christian communities seeking to take root in the love of the Lord”. He said the recent creation of three new dioceses shows the vitality of the Catholic Church in Congo, and the zeal of its pastors in their push for evangelization. (Vatican Radio) Catholic-Lutheran dialogue was under the spotlight in the Vatican on Monday as Pope Francis met with the head of the Church of Sweden and Archbishop of Uppsala Antje Jackelén. Originally from Germany, Archbishop Jackelén is Sweden’s first foreign-born archbishop since the 12th century and the first female head of the Church there. Philippa Hitchen reports…. The importance of actively promoting Christian unity, the impact of the forthcoming joint commemoration of the Reformation and the need to work together on behalf of the poor and marginalized. Those were among the key themes that Pope Francis focused on in his words to Archbishop Jackelén, noting that the Vatican II document, 'Unitatis Redintegratio', half a century ago, invites all Catholics to read the signs of the times and overcome the divisions that cause scandal and hinder the preaching of the Gospel. While there is still much work to be done, the Pope said he hoped the 2017 commemoration of the Reformation and the recent joint document ‘From Conflict to Communion’ may encourage Lutherans and Catholics to take further steps towards full unity of sacramental life and ecclesial ministry. (Vatican Radio) Pope Francis has sent a message to the President of the Pontifical Council for Culture, Cardinal Gianfranco Ravasi on the occasion of a celebration held at the Italian Senate on Monday morning marking the 750th anniversary of the birth of the poet Dante Alighieri. In the message, the Pope began by saying that he joined “the chorus of those who believe Dante Alighieri is an artist of the highest universal value, who still has much to say and to give, through his immortal works, to all those who are willing to walk the path of true knowledge”. He said that a number of his predecessors including Blessed Paul VI , Pope Saint John Paul II and Pope Benedict XVI had referred to Dante in Papal documents. (Vatican Radio) Tribulations, trust, and peace. These are the three words around which Pope Francis developed his homily at Tuesday morning’s Mass at the Santa Marta guesthouse in the Vatican. The Pontiff pointed out that the Christian does not have a "sadomasochistic attitude” when confronted with difficulties, but relies on the Lord with confidence and hope. When St. Paul is persecuted, despite a thousand tribulations, he remains firm in his faith and encourages others to hope in the Lord. Pope Francis was inspired by the passage from the Acts of the Apostles, in the First Reading, to dwell on these three points: tribulations, trust and peace – saying that to enter the Kingdom of God, one must "go through dark times, difficult times." "'To bear': is more than being patient; it means to carry on one’s shoulders, to carry the weight of tribulation. And Christian life also has moments like that. But Jesus tells us: 'Have courage in that moment. I have overcome; you too will be victorious'. This first word enlightens us to go forward in the most difficult moments of life, those moments that make us suffer." (Vatican Radio) The Director of the Vatican Press Office Father Federico Lombardi said Pope Francis is an enthusiastic supporter of peace education in schools. Father Lombardi was speaking at a press conference in the Vatican on Tuesday held to speak about the “Factory of Peace” project that has been launched by leading educational, political and church figures to help schoolchildren realise the importance of peace and dialogue with others. The press conference comes just days before a scheduled meeting between Pope Francis and seven thousand children in the Vatican (on May 11th) to talk about the themes of peace, love, welcome and integration. Father Lombardi quoted Pope Francis’ words: “We will not change the world unless we change education” and said the Holy Father has reiterated the need to foster a “culture of encounter” which can then build a harmonious and peaceful world. Such an encounter is not “vague and abstract, but an invitation to genuinely meet real people in order to initiate a thorough exchange and therefore a common path to a better society.” Father Lombardi went on to stress that this message of encounter must be repeated over and over again, in order to address world problems such as conflict, hardship, exclusion and the plight of migrants and refugees. He said the Pope is convinced that many of these problems can be traced back to a culture of waste, which itself stems from a selfish attitude. “The official website for the Jubilee has already been launched: www.iubilaeummisericordiae.va, and can be accessed also at www.im.va. The site is available in seven languages: Italian, English, Spanish, Portuguese, French, German, and Polish. On the site you will find official information regarding the calendar of the major public events, information for participating in the events with the Holy Father, and all of the official communications regarding the Jubilee. Also, through the site,dioceses will be able to receive information and pastoral suggestions, register pilgrimage groups, andrelay to us their local diocesan projects. The website uses a number of social networks (Facebook, Twitter, Instagram, Google Plus and Flickr) through which we will be able to provide updates on the Holy Father’s initiative and follow in real time the major events as they take place. We have also been studying the possibility of an app with which to better integrate all this information”. This fortnight is particularly significant for the Catholic Church, as it incorporates the feast day of figures such as Saints Peter and Paul, as well as Saints John Fisher and Thomas More. These two English Saints were martyred for the faith in the face of tremendous political pressure and persecution during the English Reformation. Saint Thomas More's last words, “I die the King’s loyal servant, but God’s first,” have continued to resonate, for Catholics throughout the centuries. (Vatican Radio) The sacrifice of one hundred and forty seven Swiss Guards who laid down their lives in defense of Pope Clement VII and the Holy Mother Church during the Sack of Rome in 1527 is commemorated each year on May 6. Yet again, that important date will be remembered on Wednesday afternoon during the annual swearing-in ceremony for new Swiss Guards which takes place in the Saint Damaso Courtyard of the Vatican’s Apostolic Palace. The Swiss Guard is the oldest standing army in the world and its motto is “Courage and Loyalty”. 2015 sees the swearing in of 32 new Guards who were received in audience by Pope Francis on Monday. (Vatican Radio) The Church will soon have three new saints and three new blesseds. Pope Francis has authorized the Congregation for the Causes of Saints to promulgate decrees elevating six lay people and religious in the process towards sainthood. Seven people count among the new Venerable, including a married couple from Italy. Among the future Saints is Junipero Serra, an 18th century Spanish Friar Minor of California. The Pope will canonize him on September 23 during his apostolic visit to the US. (Vatican Radio) Pope Francis is to receive the President of Cuba, Raul Castro, this coming Sunday, May 10th, in private audience. The Director of the Press Office of the Holy See, Fr. Federico Lombardi, SJ, confirmed the audience on Tuesday, in response to questions from journalists. Few details are known about the audience itself: it will be “strictly private,” according to Fr. Lombardi, SJ, and will take place in the Holy Father’s study inside the Paul VI Hall. The statement confirming the visit goes on to recall some of the context of the visit, including the instrumental part Pope Francis played in achieving the first significant thaw in relations between Cuba and the US since the Communist revolution on the island, led by Raul Castro’s elder brother, Fidel Castro, in the late 1950’s and early 1960’s. (Vatican Radio) Pope Francis has named two new members of the Congregation for the Doctrine of the Faith. The Archbishop of Dijon, France, Roland Minnerath and Anthony Colin Fisher, Archbishop of Sydney, Australia are the latest members to be nominated by the Holy Father to the Congregation which promotes and safeguards the Catholic Church’s doctrine of the faith and morals. (Vatican Radio) Pope Francis met on Wednesday with members of the Harlem Globetrotters, the famous basketball team from the United States. During the encounter, they gave the Holy Father a jersey with the name “Pope Francis” and the number 90. Before meeting the Pope, members of the team entertained members of the crowd, spinning their signature red-white-and-blue basketballs. 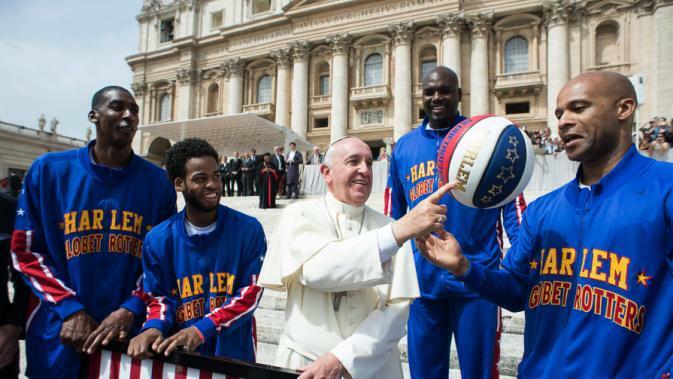 The Harlem Globetrotters met with Pope St. John Paul II in 2000, and named him an Honorary Harlem Globetrotter. grace-land -- I saw this today and it moved my heart. apparently a statute of Jesus His Holiness touched is being sent to the parents. How thoughtful! Thank you for sharing the article, Sister! 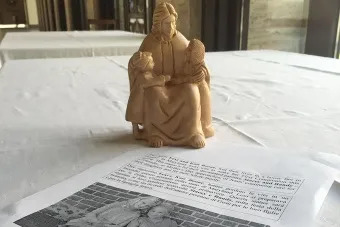 It was thoughtful of the Holy Father to touch the picture of the children with affection and prayer and to bless a small statue of Jesus embracing two children--which will be given to the girls' parents on Mother's Day. (Vatican Radio) Pope Francis met on Thursday with participants at a joint meeting of the Council of European Bishops Conferences, CCEE, and the Conference of European Churches , CEC. The CCEE brings together Catholic leaders from nearly 40 European countries, while the CEC represents over 100 Anglican, Orthodox and Protestant churches across the continent. Their joint meeting in Rome from May 6th to 9th is focused on finding a common voice to uphold religious rights and freedoms across Europe today. In his words to the leaders of different Churches and communities, Pope Francis noted that it was in Europe where the divisions between Christians began and where, for many years, they fought bitterly against each other. Today, he said, the ecumenical movement has enabled these churches to make great strides towards reconciliation and peace, though he noted there is still a long way to go to achieve full, visible communion between all believers in Christ. (Vatican Radio) Pope Francis celebrated Mass in the chapel of the Santa Marta residence in the Vatican on Thursday. In remarks following the readings of the day, the Holy Father focused on the concrete and communicative character of authentic love. (Vatican Radio/VIS) The peaceful coexistence among believers of different religions, the safeguarding of interreligious dialogue, the common commitment of Christians and Muslims in defense of cultural heritage, promotion of women, and the consolidation of the family were some of the topics that Pope Francis addressed in the speech he delivered this morning to the bishops of the Episcopal Conference of Mali, at the end of their “ad limina” visit. Following are extensive excerpts from the address. Pope Francis: Cheating to win in sport is "ugly and sterile"
“There are three paths - three fundamental pillars - for children and young people: Education – in the school and in the family –, sport and work,” said Pope Francis. “When we have all three - school, sport and work - then there exists the conditions to develop a full and authentic life, avoiding those dependencies that poison and ruin existence,” he said. The Pope said the Church is interested in sport because the Church is concerned about the person - “the whole man” – and recognizes that sport affects the formation of the person, including his relationships and his spirituality. Page created in 5.361 seconds with 19 queries.